This article is about the character in Super Smash Bros. Brawl. For other uses of "Trainer", see Trainer. The Pokémon Trainer releases a random Pokémon from a Poké Ball. The Pokémon Trainer is a playable character in the game Super Smash Bros. Brawl. He is represented by Red, the main male character of Pokémon Red Version and Pokémon Green Version, Pokémon Blue Version, Pokémon Yellow Version, and their remakes, using the design of the character first seen in Pokémon FireRed and LeafGreen Versions. Pokémon Trainer artwork from Super Smash Bros. Brawl. The Pokémon Trainer is the first playable Pokémon representative in the Super Smash Bros. series who is not an actual Pokémon. 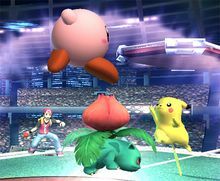 Though a selectable character, he is not an actual fighter, instead commanding any of his three Pokémon in the background of the stage, his team consisting of Squirtle, Ivysaur, and Charizard. The only move the trainer performs is Pokémon Change, which allows the player to switch out his three Pokémon at will throughout the battle. He also automatically switches Pokémon whenever one is KO'd. The Pokémon also run on a stamina system that weakens them, as their stamina decreases the longer they are out on the field. Their Final Smash is Triple Finish, which has the trainer send out all three Pokémon at once to attack. The Pokémon Trainer is voiced by Michele Knotz. The Pokémon Trainer in the Subspace Emissary. In the Subspace Emissary, he allies with Lucas who helps him find his Charizard and Ivysaur. The two also encounter Wario and a large Subspace Army robot, Galleom. They are saved from the robot's detonation by Meta Knight, and they team with him, Marth and Ike afterwards. When encountering a huge Subspace Army group on the foothills of a mountain (Meta Knight has left to retake the Halberd), they are saved by Mario and his team (Link, Yoshi, Pit, and Kirby). 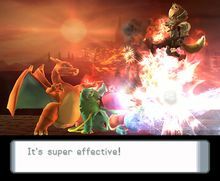 In Super Smash Bros. for Nintendo 3DS and Super Smash Bros. for Wii U, transforming during battle is omitted, so Charizard was made into a separate character, while the Pokémon Trainer, Squirtle, and Ivysaur are no longer playable. He, Squirtle, and Ivysaur appear as collectable trophies, however. 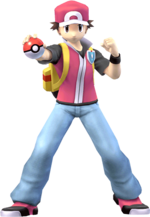 The male Pokémon Trainer in Super Smash Bros. Ultimate. The female Pokémon Trainer in Super Smash Bros. Ultimate. Pokémon Trainer returns as a playable character in Super Smash Bros. Ultimate. With the removal of the stamina system, one can play as Squirtle, Ivysaur, or Charizard for an extended period of time with no penalty. A female Pokémon Trainer variant can also be used, and is statistically identical to the male one. She is represented by Leaf, the main female character of Pokémon FireRed Version and Pokémon LeafGreen Version. Kate Bristol voices the female Pokémon Trainer, while Billy Bob Thompson voices the male. A majority of the male Pokémon Trainer's quotes are also different from Super Smash Bros. Brawl as well. Pokémon Trainer (opposite gender) The Battle at the Summit! Pokémon Change is the Pokémon Trainer's down special move, and by extension the down special move of Charizard, Squirtle, and Ivysaur. The move is based on the ability for players to switch out their Pokémon mid-battle in the Pokémon series, allowing players to switch between using Squirtle, Ivysaur, and Charizard in that order. Pokémon Change is also automatically used whenever one of the Pokémon's stamina is depleted or whenever one is KO'd. This move cannot be used immediately after respawning, or at all in midair. Status effects are also not carried over between Pokémon, though damage percentages are, and a Pokémon's stamina recharges while it is not in use. In Super Smash Bros. Ultimate, the move is much faster, and the stamina mechanic is removed. It can also be done in midair. Triple Finish is the Pokémon Trainer's Final Smash. The trainer sends out all three of his Pokémon to attack at the same time. Ivysaur hits with SolarBeam, a narrow beam of light that fires across the screen; Charizard with Fire Blast, a flame projectile that travels across the screen; and Squirtle with Hydro Pump, a water attack that sprays in multiple directions at close range, all of which deal continuous damage before opponents are knocked back by the final Fire Blast. If a player is too close to the team while they are attacking, they are knocked into the air rather than into the attack. Throughout the entire attack, a text box designed after the ones in Pokémon Diamond and Pearl appears on the bottom of the screen, saying, "Take that, Triple Finish!" If the attack hits, the dialogue changes to say, "It's super effective! ", referencing the type effectiveness mechanic of the Pokémon series. Since Charizard is the only Pokémon of the three to return in Super Smash Bros. for Nintendo 3DS and Super Smash Bros. for Wii U, its Final Smash has been changed to its Mega Evolution. Pokémon Trainer A person who raises Pokémon and trains them as partners in battle. In battle, a Trainer gives orders to the Pokémon and uses items. It's not an exaggeration to say battles can be won or lost on a Trainer's single strategic move. Trainers pour their hearts into their Pokémon and share anger, sadness, and joy as they adventure in hopes of becoming Pokémon Masters. Snake: Pokémon Trainer... That's the guy giving orders behind a Pokémon, right? Colonel: Right, and this Pokémon Trainer is controlling Squirtle, Ivysaur, and Charizard. They represent water, grass, and fire, and they're all powerful. Snake: So he makes his Pokémon fight while he sits back and watches. Sounds like a good deal if you ask me. Colonel: It's not like that, Snake. Those Pokémon wouldn't know what to do if the Pokémon Trainer wasn't there giving orders. In every battle, there's a soldier doing the fighting, and a commander telling him what to do. By working together as a team, they accomplish much more than either could on their own. So let's do this together, partner. Snake: ...Yeah... Whatever you say, Colonel. GBA Pokémon FireRed & Pokémon LeafGreen (09/2004) NA: Pop quiz! What do Misty, Brock, Cynthia, Iris, and Ash all have in common? That's right - they're all Pokémon Trainers! This Pokémon Master in the making is the same. Back in Super Smash Bros. Brawl, he fought to be the very best; like no one ever was. To smash them was his real test; to launch them was his cause! PAL: Quiz time! What do Misty, Brock, Cynthia, Iris and Ash all have in common? That's right - they're all Pokémon Trainers! This Pokémon Master in the making is just the same. He fought to be the very best; like no one ever was - back in Super Smash Bros. Brawl. To smash them was his real test; to launch them was his cause. Pokémon Trainer is one of the few fighters to only get five alternate costumes in Super Smash Bros. Brawl, instead of the usual six. This is also shared with Lucario, Jigglypuff, and Sonic. One of Pokémon Trainer's alternative costumes has the same colors as another Pokémon Trainer; Brendan's outfit from Pokémon Emerald. This page was last edited on April 22, 2019, at 19:59.